Tynemouth Video Film-Making Group started many years ago as the Cine section of Tynemouth Photographic Society and is still part of the society. The group progressed through various film formats until the advent of video, hence the name change. 2019 will be our 60th Year. We are a member of NERIAC - the North East Region of the IAC (the Film & Video Institute), and of NECA (a body representing Video Clubs in North East England). The club has a wide and varied programme, which includes talks from professionals, visiting clubs, practical nights, members nights, competitions, outings and more. The Group's continuing aim is to help and encourage existing and new members to enjoy making movies which would also be appreciated by friends and relations etc. If you have a camcorder, DSLR or mobile phone which takes video and you are interested in making more of your holiday, family, documentary or story films then why not come along or contact us. We recently entered our film 'The Dream' into a competition organised by Swan Moviemakers, from the IAC's North West Region, the trophy being 'The Ray Dunbobbin Award for Best Original Script'. Ray was a former scriptwriter and actor who worked for the BBC and ITV and was a member of Swan Moviemakers. We are pleased to announce that 'The Dream' was awarded first place! Congratulations to all concerned - including David who wrote the script and provided the voiceover, Trevor who filmed it and Reg who was one of the actors. ​We understand the trophy will remain in the care of Swan Moviemakers although a First Place certificate we be sent to us after the screening of the films at their club rooms in Bebington, Cheshire, on 12th April. ​Representatives of three of the four remaining competing clubs which now make up NECA (from Darlington, Newcastle, South Shields and Tynemouth) were present in our clubrooms as we hosted this annual competition, which had been judged earlier by Rita Hayes FACI and members of her club, Shooters Hill Camcorder Club. (two short comedies by John Burton); 'The Pudding Run' (an account of the 2018 Boxing Day Fun Run in Whitley Bay) and 'Fly Away' (the story of herring gull chicks) by Trevor Ermel; 'The Lighthouse' (filmed at Tynemouth on a very stormy day, with an atmospheric soundtrack and self-penned poem) by Alwyn Scott; and 'Next, Please' (a club film written by David Peffer, filmed by Trevor Ermel and featuring several club members). The Tynemouth members whose films made up the winning entry receive their certificate from Brian Dunckley. The opportunity was also taken to present the trophy to Tynemouth for providing the winning film in the IAC inter-regional one minute Mini Mermaid Competition at last year's IAC Annual General Meeting in Market Harborough. Our short comedy 'The Critic' was written by David Peffer, filmed by Trevor Ermel and featured John Cook (who unfortunately was not present for the presentation) and David. ​Nine members were present to see the presentation of trophies and awards to this season's competition winners, when we enjoyed fish & chips and a showing of some of the films. The picture below (taken by John Cook) shows the Chairman with the award-winners. ​An audience of about 25 were present when we hosted the NECA Annual 'Open' Competition on 27th November. ​The competition had been judged by Reg & Annabelle Lancaster, both FACI, from the South East Region of the IAC. All fourteen entries were screened and provided a varied programme for those present. 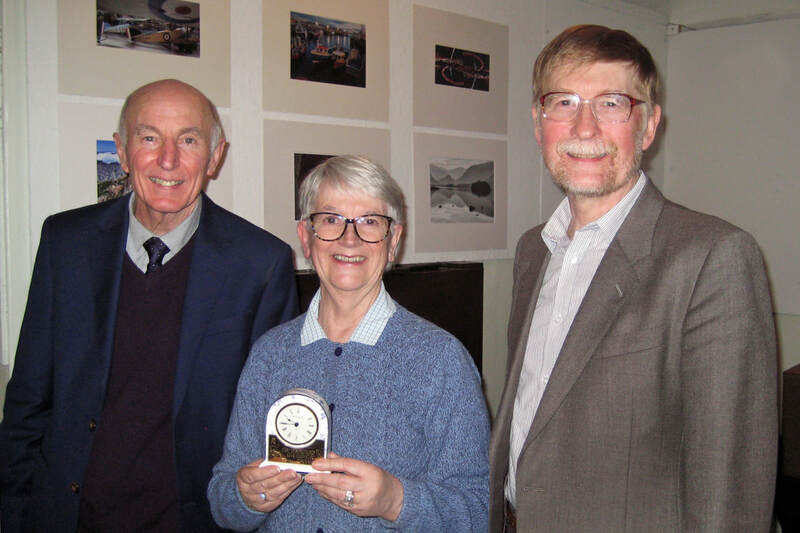 ​Runner-up in the competition was Tynemouth's own Trevor Ermel with his entry 'Bell Ringers of North Shields', a documentary shot in Christ Church, North Shields showing the resident bell ringers in action, with explanatory interviews from two of their members. He was awarded a certificate and cash prize by the NECA chairman, Brian Dunckley. Eight members were present for a social evening with fish & chips and for the presentation of the awards to the winners of this season's competitions. 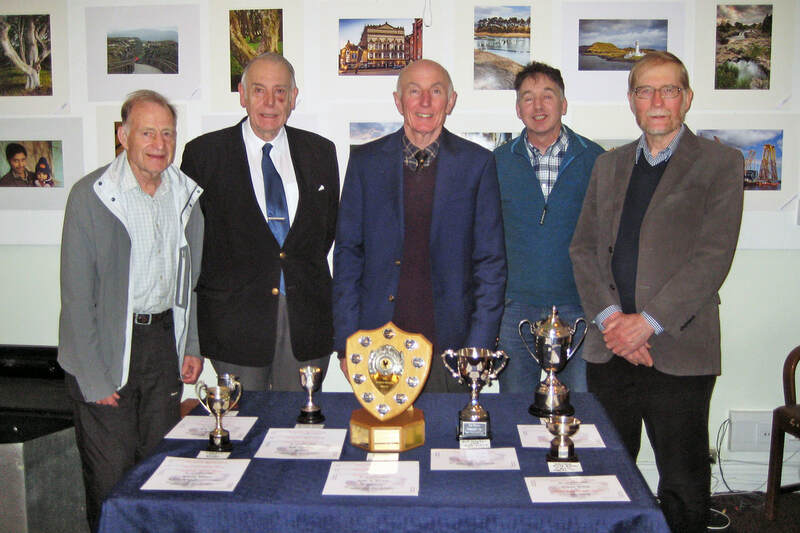 Pictured above (left to right) are Competition Secretary Trevor Ermel, winner of the Christy Cup (Holiday Competition), the Bucas Cup (One Minute Competition), the George Draper Shield (Annual Competition) and the Dawson Rose Bowl (highest aggregate of marks for placings in all competitions); retiring Chairman Doug Tweddle; and Secretary John Burton, winner of the Richardson Cup (Open Competition), the Kip Halsey Memorial Trophy (best nature content in any film) and the Nichol Cup (highest number of new films entered this season). ​TYNEMOUTH VIDEO FILM-MAKING GROUP were the winners of a 20 minute programme competition held at South Shields with films produced by their members. The certificate was presented to the Group’s chairman Doug. Tweddle by Brian Dunckley, President of NECA (North East Cine Association), which holds this competition annually. Each club provides a minimum of 2 films in their programme to give a maximum running time of 20 minutes. They are carefully considered for quality, content, and overall entertainment value. The films have no subject restriction and were judged by well-known I.A.C., B.I.A.F.F., and U.N.I.C.A. judges Annabelle & Reg. Lancaster in London. Our entry consisted of 4 films; Trevor Ermel’s “Croatian Contrasts”, “Alfie & the Kaiser” by Doug. Tweddle, and secretary John Burton’s “Weally?” The other film, “Lost in Translation”, was a group comedy written by David Peffer, filmed by Trevor with David & John as the cast. IMPORTANT LEGAL WARNING: All images and content appearing on this website are copyright of the photographer and of Tynemouth Video Group. No image or other content from this site may be reproduced in any form without specific written permission and to do so without such permission is an unlawful act that may result in legal action.